Konstantin Konev is a firearms and accessories designer. He contacted me a couple of weeks ago and asked if I want to take a look at his rifle design. 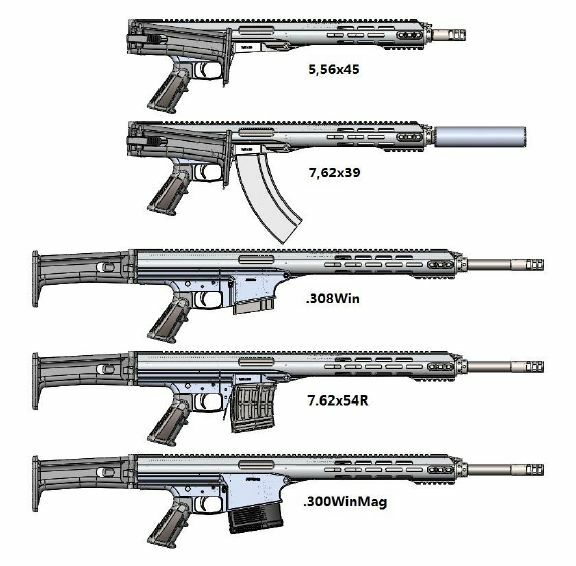 I was anticipating to see something like another AR or AK based rifle and it was really surprising to see an actual new firearm design with a lot of interesting features. And that is the subject of this article – the Konev Modular Rifle. 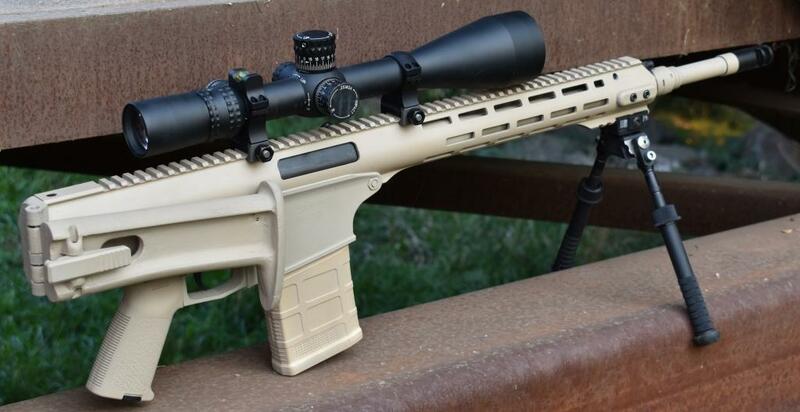 Let’s take a look at different design features of this rifle. Konstantin Konev started his gun designing career in 1998 in Belarus. Later, in 2006, he moved to Ukraine and was the CEO and Chief Designer of a company called Zbroyar. After 7 years working in Zbroyar, he was employed by Caracal of UAE. In 2015, he moved to the USA. Konev’s rifle is designed to be a modular platform. It can relatively quickly change the calibers, magazine wells and barrel lengths to match the needs of any particular task. In order to do a caliber and magazine change, the user needs to change the magazine well, bolt head and barrel. The lower receiver is made of glass reinforced polymer and has a two-piece design with a separate magazine well portion. Note the vertical joint line of the receiver and magazine well. There are several magwell options allowing to feed the rifle from various magazines. As shown in the drawings below, the design allows to convert it to a rifle fed from STANAG or AK magazines. 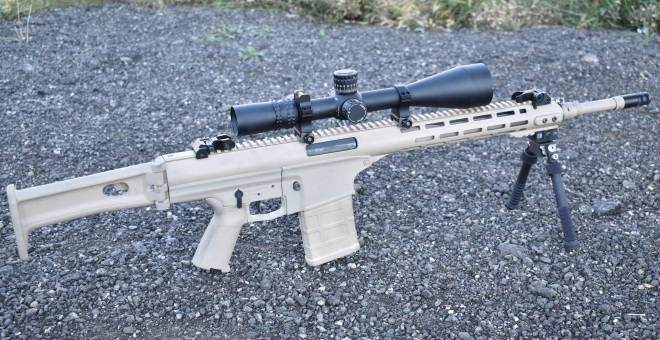 It can also be converted into a battle rifle/DMR with a 7.62x51mm NATO size receiver. 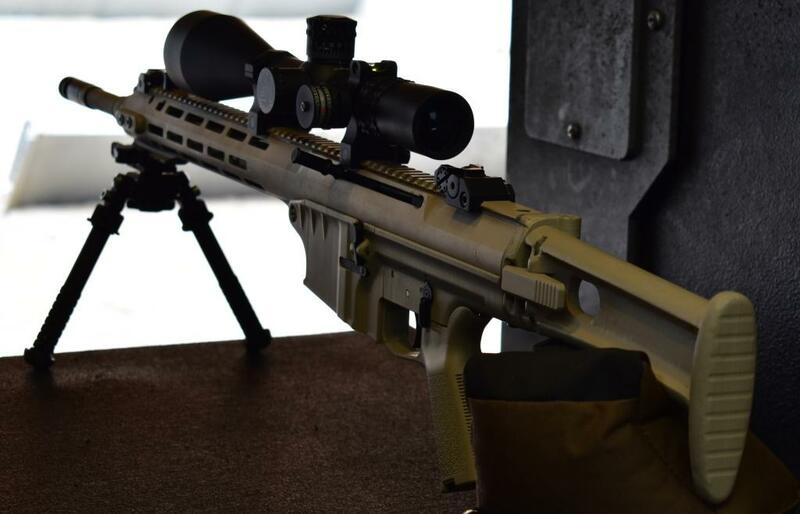 In this configuration, there are also two magazine well options allowing to feed from an AR-10 pattern or SVD magazines. And lastly, it can also become a long-range rifle chambered in .300 Win Mag. With the capability to convert to so many action lengths, imagine the number of possible caliber options for this weapon system. As you can see in the images, Konev’s rifle has a monolithic upper receiver. It is a rigid one-piece platform for mounting multiple optical devices and ensuring their perfect alignment. The handguard portion of the upper receiver also features M-LOK accessory mounting slots. All Konev Modular Rifle versions are gas operated firearms utilizing a short stroke gas piston. They have an adjustable three position gas block. The gas system can be disassembled from the front of the rifle. Interestingly, the gas block of this rifle is the point where the barrel is attached to the upper receiver. 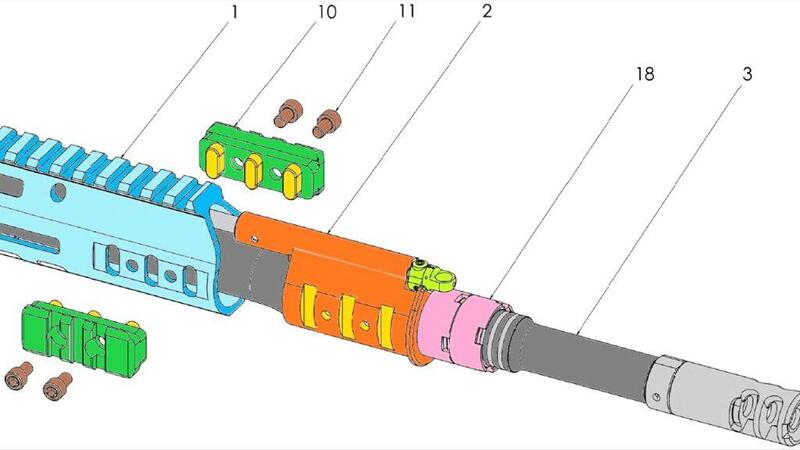 As shown in the image below, there are special attachment parts with integrated lugs. These parts are fastened from either side of the upper receiver thus attaching it to the gas block which in its turn is attached to the barrel. According to the designer, such barrel attachment method allows making the weapon more accurate because it provides a very short free floated portion of the barrel which will vibrate with a smaller amplitude than in case of full-length free floated barrels. The barrel is attached to the upper receiver via the gas block (patent pending design). Konstantin also points out that gas operated firearms have a distinct design issue of the gas block applying forward pressure to the barrel causing it to flex in a more violent and asymmetric pattern which leads to accuracy decrease. Once the gasses enter the gas block, they not only push the gas piston back but also apply an equal amount of pressure to the front wall of the gas block which transfers that energy to the barrel. In case of the Konev design, this problem is minimized by having the gas block attached to the upper receiver, too. Also, the gas block of Konev’s rifle is a very low profile one further decreasing the mentioned negative effect. A typical piston-operated gas system. Red arrows show the directions of gas pressure forces. The gasses push the piston back (the left arrow) to cycle the action, but at the same time, they push on the gas block (right arrow) applying force to the barrel. The higher the gas block, the larger this leverage and harsher the stresses on the barrel. This system also allows to relatively quickly change the barrels to have a different barrel length or change the caliber. The lockup of the Konev Modular Rifle action is accomplished by a 3-lug rotating bolt. The locking mechanism also has a primary extraction feature built into the bolt lugs. It is accomplished via the angled surfaces in the rear portion of the locking lugs which match the similar surfaces in the locking recesses of the barrel extension and transfer some of the rotational motion of the unlocking bolt into a linear motion with a higher leverage. As in the case of any other primary extraction mechanism, this one also ensures a more reliable extraction of the fired cases that are stuck in the chamber (for whatever reason – dirty chamber, poor quality ammunition etc.). Another good feature of a modern rifle is the folding stock. Konev Modular Rifle has a side folding stock made of aluminum. In order to fold the stock, the user must unlock it by pressing the large external latch. It is possible to fire the rifle with the stock folded. The version shown in the images is one that Konstantin calls a “Carbine” stock. It is a non-adjustable one. There will also be a stock version called “Marksman” which will have a length of pull and cheek piece height adjustability features. 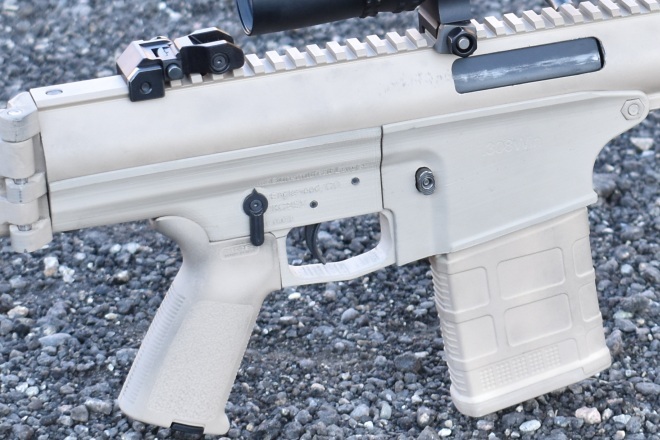 Konev Modular Rifle has a side charging handle on the left side of the receiver. It is a reciprocating and non-reversible one. The designer also works on making a charging handle which will be possible to disconnect from the bolt carrier and convert it into a non-reciprocating charging handle. Although the Konev Modular Rifle is quite different from the AR platform, it still utilizes the AR-15 trigger mechanism. The location and function of the safety selector, magazine release button and bolt release are identical to that of the AR-15 which will make it easier to get familiar with this weapon. The rifle is also compatible with AR-15 grips. Below you can see the dimensions of the Konev Modular Rifle in .308 Win configuration. The dimensions are in millimeters. If the dimensions are illegible, open the image in a new tab of your browser to see its larger version. Here is also some video footage of the designer shooting the rifle. This is all the information available on this weapon system so far. As soon as more details are released or if there are any developments concerning the manufacturing and availability in the US, we will keep our readers informed. 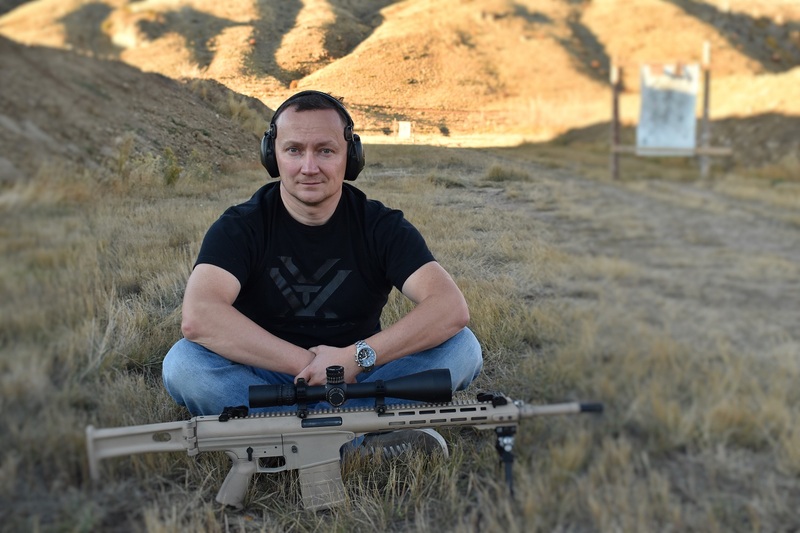 As Konstantin told, he is planning to manufacture the Konev Modular Rifle in the USA. His primary goal is to sell the manufacturing rights to a US company. However, even if that doesn’t work out, he will set up a shop and start making the rifles himself. 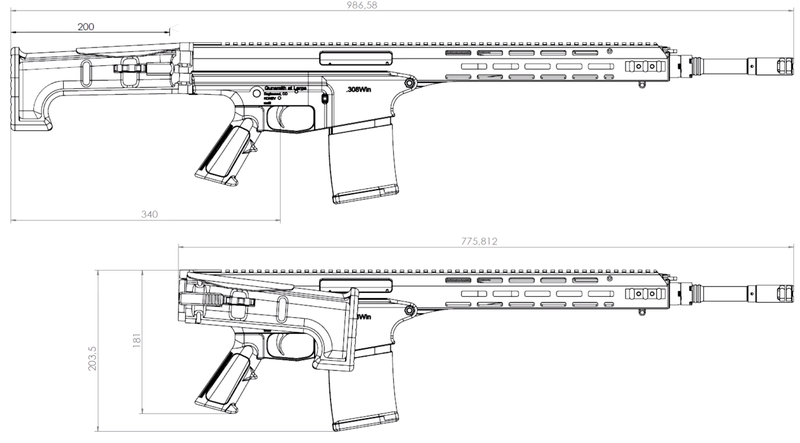 The designer considers the US civilian market as his primary market, however, he doesn’t exclude the possibility to offer the rifle for military trials.